A lot has been written in the last couple years about ride-share services like Uber threatening the livelihood of cab drivers. In most of these articles Uber, Hailo, Sidecar, et al are pitted against local taxi companies like Yellow and Carriage. What is rarely made clear is that none of these companies—ride-share or traditional taxi—actually employ any drivers. So while they fight it out in the courts about regulations and who can and cannot get what part of the transportation market, the people doing the actual driving aren’t being represented by either side. 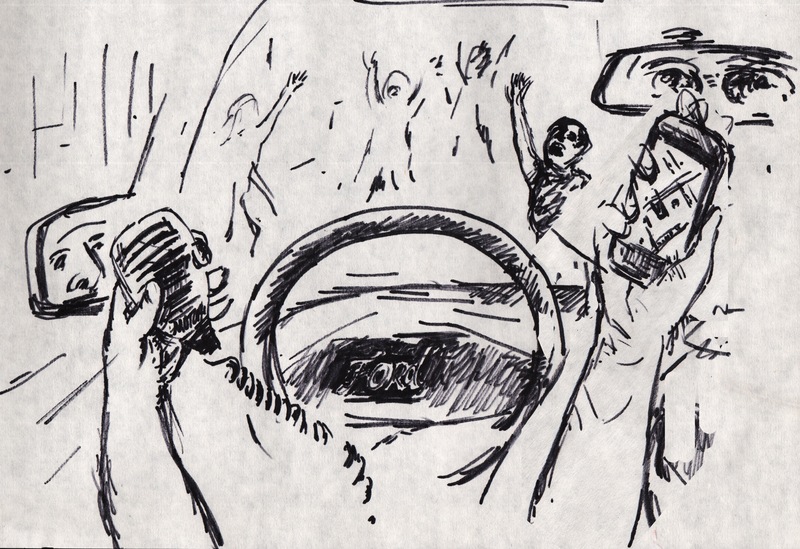 In 1993—when I became a cab driver—calling a taxi was a simple business. You picked up your home or office telephone, dialed your favorite cab company, and waited outside for your ride to arrive. A cabbie had two choices for picking up fares: troll the streets for passengers or “play the radio,” which meant turning on the two-way and submitting to the whims of his company’s dispatcher. Picture Danny DeVito in “Taxi” for an idea of the types we had to deal with. A year or two into the job I got a bag phone for the cab. For those who don’t remember, this was an early version of a cell-phone which had to be plugged into the cigarette lighter in order to function. If you wanted decent reception, you would also suction-cup an antenna to the top of your car and attach it to a wire that passed through the driver’s-side door and end at the phone, which took up a healthy amount of space between the front seats. This complicated rig enabled the cab driver to receive calls directly from customers, thereby giving him a way to increase his income. Dispatched calls changed in the 2000s with the advent of Gandalf terminals in taxis. Now, instead of a squawking voice giving you a constant low-grade headache throughout each shift, a screen listed available fares and it was just a matter of hitting the right buttons quicker than the other drivers to get the address of your next fare. Cell-phones evolved as well, so your regulars could summon you by voice or text with minimal effort. A few years ago, apps like Taxi Magic began to appear. They worked with cab companies to allow customers easier access to cabs. Taxi Magic gathered together the phone numbers of all local cab companies in one spot so they were easier to find. Unfortunately they did nothing to improve the problems of traditional taxi dispatching. Riders were still at the mercy of telephone operators who would stop answering the lines at peak times and drivers who had no compelling reason to pick up calls if there was enough business available on the street. The best either company dispatchers or Taxi Magic could ever do was let drivers know what fares were available, then hope, or sometimes plead that the driver would take them. The reason no company could compel a driver to pick up a passenger is that cabbies no longer work for companies. They all drove for themselves. Back in 1993, when I started driving, there were a few old-timers who were still working on commission. This meant that the company would take a percentage of their shift earnings, offer them benefits like health care, and treat them as part of their company. If they had a bad night the company would make less, which would cushion the blow. Newbies like me didn’t have this option. We had to pay to lease and gas up the company’s vehicles whether we made a dime during our shifts or not. It was a fundamental shift. Taxi companies were now basically rent-a-car agencies. There are about 7,000 licensed taxis in Chicago. Those licenses—called medallions—currently trade for more than $300,000 each. Many medallion owners pay companies like Yellow Cab to manage the upkeep of their vehicles, make sure they pass yearly city inspections, and find drivers to lease the vehicles to. The city is heavily involved in regulating the industry, from setting meter rates to licensing drivers, though it remains a private business rather than a public utility, at least where taxes are concerned. The gray area between public and private makes the taxi business different than most others. The cab driver is providing a public service yet he’s not an employee of either the city or any company. He’s bound by many restrictive regulations yet rarely benefits from any protections a union or corporation can provide. Cab drivers hit the street at the beginning of every shift already in the red because we either owe the company that day’s lease or, if we’re owner-operators, we’re paying off the mortgage on the medallion, the car payment, or both. We look for every way to get access to more fares. So when Uber came to town in 2012 it seemed like a great chance to make a little more money. I was one of the first cab drivers they recruited in Chicago. Uber is not a traditional taxi or limousine company. They don’t have a garage and they don’t own vehicles. They’re a tech company that developed a dispatching app. They contract limo, taxi and private-vehicle drivers and handle payment, routing and other services through iPhones they distribute to participants. In Chicago they use current taxi rates and add twenty percent to cover their fees as well as tips for drivers. They charge flat fees for limo rides, which are generally a little more affordable than established limo companies. But with both taxis and limos they piggyback on existing pay structures and regulations to offer drivers an alternate way to pick up customers. They don’t have to worry about insurance or any of the other bureaucratic headaches that old companies have to deal with. All they concern themselves with is their iPhone app which connects drivers and riders. The app is a two-way GPS which lets both driver and rider track each other’s location and make contact if plans change. Cab companies currently have nothing approaching this kind of one-to-one connectivity. There is also a rating function which allows both sides to rate the ride. It’s like Yelp except if the restaurant could rate its customers as well. It gives everyone concerned at least a bit of a clue what they’re in for. One of the hardest things about driving a cab is guessing how a person getting into the car with you will behave themselves. This system takes a bit of that guesswork out of the equation. You can see their history with the click of a button. I only used Uber for a few months before quitting the business in the summer of 2012 but came away impressed. In the last couple years there has been a lot of litigation about how ride-share will fit into the city’s public-transportation ecosystem. Services like Uber X and Sidecar, which use private cars rather than licensed taxis and limos, add another wrinkle to the puzzle. This is an age when full-time single-source employment seems to becoming but a fond memory. People are scrambling to cobble a living together any way they can. It’s a world of Airbnb and Etsy rather than Hilton hotel and Sears, so it’s no surprise that people would try to earn some side cash using cars they already own. I’m not sure how it will all shake out but I’m convinced the cab companies are fighting a losing battle. The reason upstarts like Uber have made inroads into their business is that the taxi companies have failed to serve either their customers or their drivers well. By no longer offering commissions or benefits to drivers they have created an adversarial relationship where each side tries to get over on the other rather than working together. By failing to recognize advances in technology, they have mired themselves in an antiquated dispatching system that no one involved has much confidence in. In my last couple years behind the wheel, most of my business came from either street hails or by direct text from repeat customers and their friends. No one these days wants to sit on the phone waiting for an operator to pick up on the other end. Don’t take this to mean that ride-share is a cure-all. Uber has made blunders like peak-pricing, which put me in mind of price-gouging gas stations during the seventies fuel crisis. They’ll also undoubtedly need to require private-car drivers to carry commercial insurance. Almost half the cost of my cab lease was to cover insurance of various kinds. Otherwise drivers will spend more time in court than on the road. These new businesses will have their growing pains, but the city would be wise not to regulate them to death. If Chicago shuts Uber et al down, ride-share will simply go underground. The industry has to acknowledge the way their customers live now. We’re used to having access to any service we want at our fingertips, so taxi companies need to adapt or die. Starting to treat the drivers, who make their existence possible, like valued customers rather than chattel wouldn’t hurt either. There will always be a place for public vehicles in a city like Chicago. If Yellow Cab and its ilk wants to be part of that market, it would do well to realize that it’s 2014 rather than 1974.